What has 132 rooms, 35 bathrooms, and 6 levels? Hint: it's not your apartment building! It's the White House. Our beautiful national treasure, worth roughly $300 million dollars, is one historic home Venyou has yet to cover. The journey of the White House started in the late 1700's when Pierre L'Enfant was commissioned to build our nation's capital, later known as the District of Columbia. L'Enfant had envisioned a grand residence for the President and put out a public bid for architects to submit their best and brightest drawings for their new President George Washington. The winner, James Hoban, was selected by George Washington himself and construction began in 1792. James Hobin's bid for the White House. The home took 8 years to construct and was finished in 1800. However, from there, the home never really stayed the same. Thomas Jefferson immediately put his spin on the mansion by adding colonnades that concealed the stables and storage. The War of 1812 nearly torched the home in its entirety. James Monroe reconstructed the home to its original glory in 1817. Theodore Roosevelt had all work offices relocated to the West Wing in 1901 and in 1909 William Howard Taft expanded the West Wing and created the first Oval office. We could continue with the changes to the home but that would nearly pacify us all. Needless to stay, the White House is truly a living, breathing structure and hasn't slowed down in its 224 years of existence. The home truly stopped changing during the Truman era and Jaqueline Kennedy made it her mission to declare the White House a museum. After each administration items in the White House are turned over to the Smithsonian Institution for preservation, study, storage, and exhibition. Now, any modifications to the home need to be approved. Today, the White House complex has 5 inclusive structures. The White House complex is comprised of the Executive House, the East Wing, West Wing, the Eisenhower Executive Office Building, and The Blair House. The Executive Home is the primary residence for the First Family. The White House doesn't just include rooms for work but also play. It holds a bowling alley, tennis court, movie theater, jogging track, swimming pool, and putting green. The Chief Usher is responsible for the home's day-to-day operations and ensures smooth coordination between staff and current family. 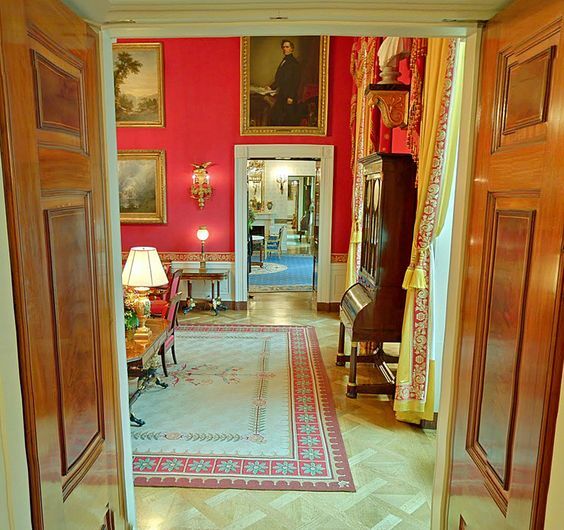 The West Wing is comprised of the Oval Office and workspace for his senior staff that can hold roughly 50 employees. The West Wing is the location the President conducts meetings and the Cabinet meet. It is also the location of the Situation Room, Press Briefing Room, and Roosevelt Room. The East Wing hold additional office space primarily for the use of the First Lady and the White House Social Office. The White House grounds cover 18 acres in the heart of Washington, D.C. The grounds are the location of tennis courts, rose gardens, greenhouses, and many events. May this amazing home withstand many administrations to come and continue to be a shining light in our National history.